Welcome to the Website for Associated Industries of Florida...The Voice of Florida Business! development, and welfare of industry and business and the people of the state. The Most Advanced Manufacturing Marketplace in the World. Period. Get the latest information vital to the interests of Florida's businesses! 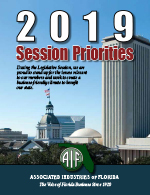 Use the navigation arrows located in this section to scroll through all the latest information from AIF or click below to visit our Information Center.